In Mongolia, influenza activity started from end of December 2018 with predominantly influenza A(H1N1)pdm09 followed by A(H3N2) viruses. The Virology Laboratory, National Influenza Center, National Center for Communicable Diseases has tested 1065 specimens from the 40th week of 2018 to the 2d week of 2019. 402(37.7%) specimens were positive for influenza and other respiratory viruses of these were 121(30.1%) influenza A(H1N1)pdm09, 9(2.2%) influenza A(H3N2), 130(32.2%) RSV, 14(3.5%) Coronavirus OC43/NL63, 39(9.7%) Rhinovirus, 44(10.9%) Parainfluenza, 15(3.7%) Bocavirus, 14(3.5%) Adenovirus, 9(2.2%) Enter virus and 6(1.5%) mycoplasma pneumonia (Figure1). Figure1. Respiratory viruses detected by rt PCR from the 40th week of 2018 to 2d week of 2019. 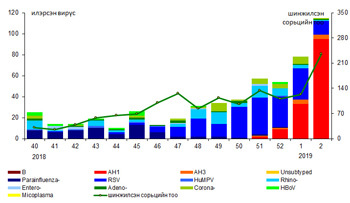 We have sequenced HA gene of the influenza viruses isolated in Dec. 2018 and Jan. 2019 and the phylogenetic analyses shown that the A(H1N1)pdm 09 viruses within subclade-6B.1 defined by HA1 amino acid substitutions N146D, T202I and N277D. These viruses were similar with vaccine strains A/Michigan/45/2015(H1N1)pdm09 and IVR-180 A/Singapore/GP1908/2015 in the 2018/2019 season (Figure 2).